MANCHESTER- Irene Teresa (Lafrance) Taylor, 89, died peacefully on Thursday, September 6, 2018 at the Mt. Carmel Rehabilitation and Nursing Center in Manchester, NH, with her devoted granddaughter Amy Taylor by her side. Irene was born in Nashua on March 22, 1929, the eighth of twelve children of the late Joseph Lafrance and Alice (Baron) Lafrance. She was the beloved wife of the late Ronald James Taylor. 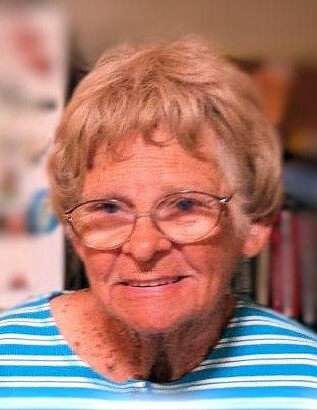 Irene is survived by her three children, James Taylor and his wife Glenys of Nashua, John Taylor of Nashua, and Karen Taylor and her wife Karen Daniell of Stratham, NH; five grandchildren, Amy, Keith, Crystal, Kenny and Michael; seven great-grandchildren, Caitlin, Nathaniel, Kane, Camille, David, Christian and Alexander, and one great-great grandchild, Michael. Irene is also survived by three sisters, Maryanne Castonguay of Highgate Springs, VT, Cecile Duquette of Nashua, and Alice Plautz and her husband Arthur of Madison, WI; as well as numerous nieces, nephews, and cousins. Irene was a lifelong parishioner of St. Louis de Gonzague Church where she served as a greeter for many years. She enjoyed gardening, long walks around Nashua and weekend getaways to Hampton Beach. She took great joy in “a little something good,” whether it was as exciting as a bingo win or as simple as an ice cream cone. Irene enjoyed helping others and cherished time spent with family and friends. For many years Irene was employed by Caron and Berube Insurance Agency in Nashua and later by Courier Westford (Murray Printing) in Westford, MA until her retirement. Irene’s family would like to extend a special thank you and a joyful and heartfelt “Deedle Dee” to her extended family on the 3rd floor at Mt. Carmel for the compassion, care, and love shown to and good things shared with Irene during the four plus years she lived (and walked) among them. 6 PM at ANCTIL-ROCHETTE & SON FUNERAL HOME, 21 Kinsley Street, Nashua. Her Funeral will take place on WEDNESDAY, September 12th at 10 AM in St. Louis de Gonzague Church, 48 W Hollis Street, Nashua. Interment to follow in St. Louis Cemetery, Nashua. In lieu of flowers, donations may be made in Irene’s name to Catie’s Closet, 19 School Street, Dracut, MA 01826 or to End 68 Hours of Hunger-Nashua, c/o The United Way, 20 Broad Street, Nashua, NH 03064.